Nestor Velasquez had a stable job in Iloilo, working for a shipping company as an officer-in-charge of day-to-day operations. Despite being with his employer for a decade, Velasquez felt dissatisfied at merely taking home a monthly paycheck and longed for better-earning opportunities. In 2011, Velasquez decided it was time to pack his bags and go back to Mataasnakahoy, Batangas, his hometown. The family sold all their possessions and only brought with them whatever could fit in the family car. Going back to his hometown in Batangas meant finding a new source of income. Without a job and with a wife and two children to support, Velasquez decided to use a small space in his mother’s sari-sari store and set up a small food stall. For two years, he cooked Filipino viands and sold them for breakfast and lunch. In the afternoon, his wife Johna sold merienda (afternoon snacks) to different offices. The couple earned Php400 to Php500 on a good day. The couple’s food stall menu consisted of local Filipino dishes including Sinaing na Tulingan (braised mackerel tuna), a recipe that has been with his family for decades. Velasquez would also take orders of this dish and sell them per palayok (clay pot) containing four kilos of the fish for Php850. The idea of canning his precious family dish came by accident when a customer placed an order but failed to claim the dish. Velasquez and his family were forced to eat it for more than a week to cut his losses. It was this incident that gave him the idea of bottling the Sinaing na Tulingan. “Naisip ko bakit hindi ko i-preserve o ibote itong Sinaing na Tulingan para wala ako pressure pag ginawa ko siya ngayon Php100 pesos siya, bukas Php100 pa rin siya kahit next month Php100 pa rin. Hindi yung value niya nade-degrade (Why not preserve or bottle the dish? That way, there’s no pressure. So, if I cook the dish for Php100, tomorrow it would still be worth Php100 and even next month it would still be worth Php100. The value will not degrade),” he shares. Rather than abandon his goal of canning the dish, Velasquez became even more excited and determined to start a new business venture. He spent long hours researching online on home canning, relying heavily on the literature provided mostly by the United States Department of Agriculture. With the knowledge he gained from his self-study, he conducted kitchen experiments for a week to standardize his recipe for canning the dish. “Nung una trial and error, marami nawawala sa lasa na niluluto sa palayok at nilalagay sa bote. Nagiiba. Sabi ko pamana to, dapat ma-infuse ko ang traditional sa modern. (It was trial and error at first. The taste of the dish cooked in the clay pot changes when placed inside a bottle. This is an inherited dish, so I had to combine the traditional and modern),” Velasquez recalls. Armed with Php50,000, which was the last of his family’s savings, Velasquez traveled to Manila to buy a pressure canner and 600 glass bottles and brought them back to Batangas using public transportation. He recalls feeling elated with his purchases until he realized he no longer had the funds to buy the ingredients, prompting him to borrow money from his mother and a sibling. “May bote, may pang canning, pero wala nang pangbili ng isda (I had the bottles, the canning equipment, but I had no funds left to buy the fish),” he says. He went to sell his canned to two popular local resorts nearby and continued selling cooked dishes in his food stall. 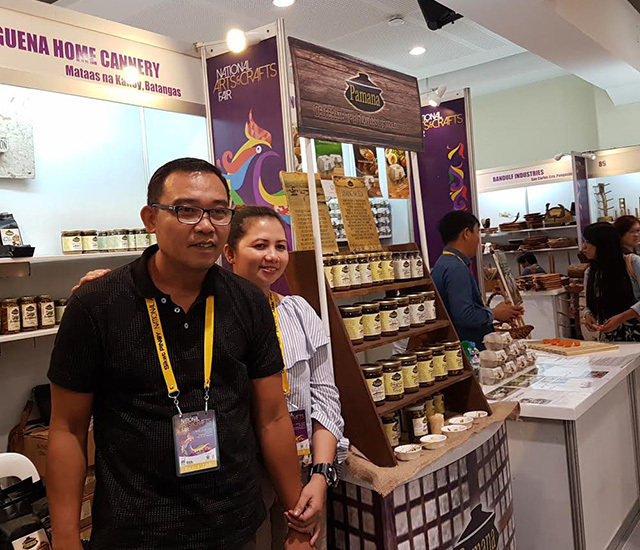 Velasquez says his real break came in 2013 after he registered his business with the Department of Trade and Industry (DTI) and started labeling his products as Kusina Batangueña Home Cannery. With the help of the DTI, he was able to find cheaper suppliers for his bottles and attend government-sponsored seminars on entrepreneurship. He was also asked by the DTI to participate in one of its regional trade fairs, Kalakal, to sell his goods. 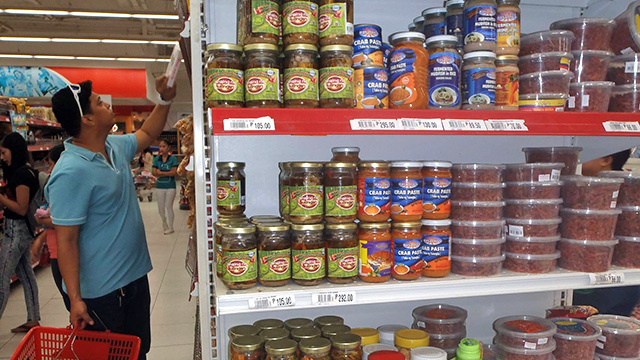 His canned Sinaing na Tulingan was awarded third most innovative product, which gave him the confidence to ask Robinsons Supermarket in Lipa to carry his product. He eventually signed an agreement with a distributor to sell the bottled dish in several branches of the supermarket in Batangas and Metro Manila. That same year, Velasquez decided to close his food stall to focus on expanding his canning business. Without funds to buy additional equipment and stocks, he was forced to borrow money from an informal lender, which charged him an interest rate of 30 percent per annum in 2014. With the Php300,000 loaned money, he bought a 20-year-old secondhand van, new pressure canners and an inventory of bottles. He also rented a separate space for his kitchen. The additional kitchen space and equipment allowed him to increase his production volume from 90 boxes to 300 boxes monthly. The rest of the loaned money was spent obtaining a Food and Drug Administration (FDA) approval. His investments paid off. 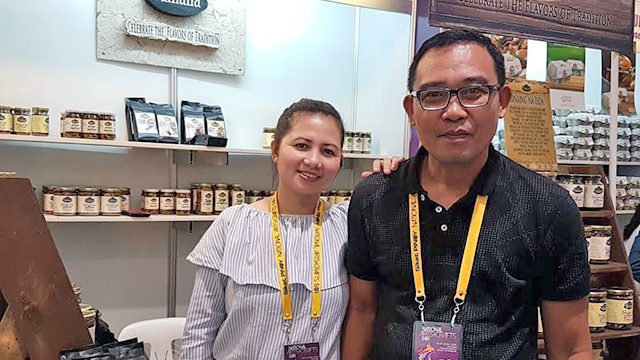 With his increased production and FDA approval, he was able to supply to Manila-based restaurants, which relabeled the Sinaing na Tulingan as their own. He even bagged the most innovative product in a DTI-sponsored national fair, SIKAT Pinoy, in 2015. Velasquez was also able to pay his loan in two years instead of three, saving him Php90,000 in interest payments. Indeed, Velasquez’s food business has come a long way. Kusina Batangueña now grosses Php324,000 to Php432,000, based on his monthly output of 3,000 bottled Sinaing na Tulingan. That translates to daily revenues of Php10,800 to Php14,400—a far cry from his daily earnings of Php400 to Php500 from selling cooked food. The canned dish is also available in select Puregold supermarkets in Metro Manila and other supermarkets in Visayas and Mindanao. He also added more products such as Kapeng Barako, Sinaing na Tawilis, and Atsara na Papaya, Sigarilyas and Ampalaya. These days, he is busy preparing for Sinaing na Tulingan’s debut in the United States. Velasquez says he is in talks with a dealer who plans to distribute the canned dish in the US and also working on getting a halal certification. Selling his produce abroad, he says, has always been his goal. Velasquez, now 47, also hopes to purchase land and build a commissary in the next few years so he can grow his cannery even more. After all, his business started with an inherited recipe and he finds it fitting to hand down a stable business to his children from his inherited dish.